BALTIMORE, MD: In an era where classrooms, churches, and concert venues can no longer be considered completely safe, it behooves all of us to keep a watchful eye out – and prepare for the worst. This is especially true for police officers and medical personnel. 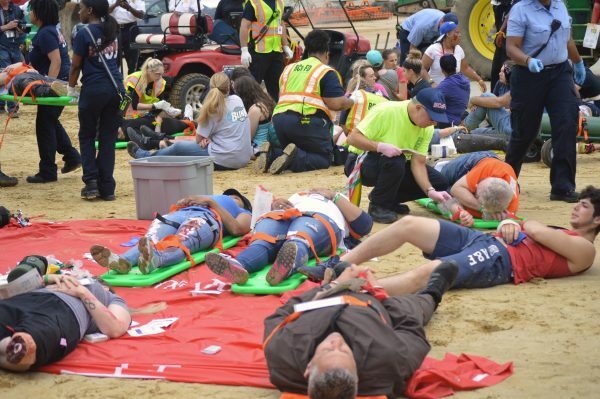 Knowing this reality, preparation was the goal of about a dozen local private and governmental entities that took part in yesterday’s full scale mass-casualty exercise at the Pimlico Race Course. 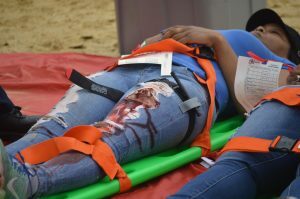 The exercise, organized by Sinai Hospital, in cooperation with the track and local police and fire departments, offered first responders the opportunity to enter the scene of a mock mass-casualty event. 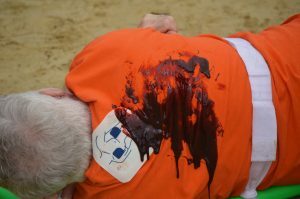 Once on the ground, their skills were put to the test, as they encountered nearly 100 “injured” volunteer actors with an assortment of bloody stage-makeup wounds – desperately crying for help. 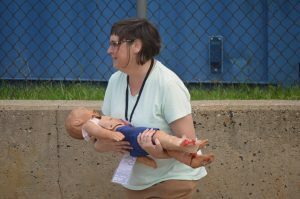 Martha Hill – Emergency Preparadeness Coordinator for Sinai Hospital – said the exercise has been in the works for about six months. 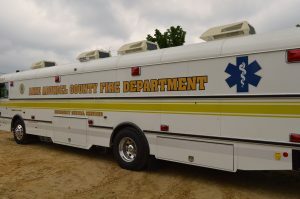 “It is a collaboration between the Baltimore City Fire Department, Baltimore County Fire Department, and several private agencies, organizations, local businesses and law enforcement agencies. We come together to leverage our training exercises to get some practice on how we would work together in a large scale event. Police and paramedics were already awaiting a signal to go when the exercise started with a bang at 9 a.m. But for accuracy’s sake, Pimlico Race Course security personnel were the first to enter the scene. On any normal spring day at Pimlico, the cries in the air are for a favorite horse. But today, Old Hilltop reverberated with desperate cries for help. The police soon followed, but they too were forced to work outside of their comfort zone. Some spread out to man the perimeter, while others gently tended to the writhing wounded. Medics arrived and set to work under the direction of the police. For all they knew, there could still be a deranged individual ready to open fire on the emergency teams. To the casual observer, it was difficult to see any major faux-pas with the actions of the first responders. But seasoned evaluators were quick to step in and offer guidance where they thought an action could have been executed better. A small all-terrain truck, for example, was a great way to evacuate the wounded. But moving a woman, who was still somewhat mobile, into the seat next to the driver cleared a much-needed place in the truck’s bed for a severely injured man on a stretcher. We asked Hill if she sees this sort of exercise becoming an annual event? Captain Scott Goldstein of the Pikesville Volunteer Fire Company explained the protocol for the first responders. “Today we’re running a multi-jurisdictional drill simulating a mass-casualty incident. We’re coming in here assessing, triaging and transporting patients to Sinai Hospital, as we would in a normal live-fire scenario. 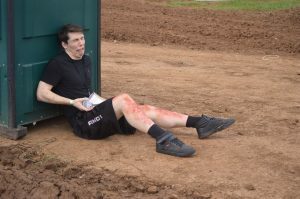 With dozens of blood-drenched actors moaning off to our right, I asked Goldstein how he thought the exercise was going? Having personally visited the Sinai emergency room on more than one occasion, I wondered how many patients the hospital could handle had this been an actual emergency? In the triage area, situated near Pimlico’s northernmost gates, medical teams applied bandages to gaping wounds while questioning the actor/patients about their injuries. 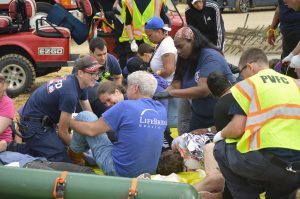 Assessing priorities, some immobile patients were laid on backboard stretchers and then placed in compartments aboard an emergency service bus from Anne Arundel County. Goldstein said that, in addition to the emergency services bus and the assorted ambulances on site, fire officials could call on the MTA. Transit buses could then be used to take some of the less critically injured patients to area hospitals. An hour into the exercise, the Pimlico infield had been successfully cleared. The most critically injured were on their way to Sinai Hospital. 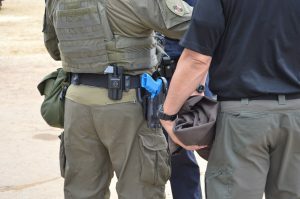 But a few actors remained to take part in an unscheduled exercise which paired paramilitary police officers with a smal group of body armor-clad medics. Once the actors were in place, two phantom-rifle-toting officers in olive drab fatigues carefully walked the length of the tunnel to secure the area for the medical teams. Hand signals were used to beckon a cluster of black-helmeted medics and their ever-vigilant police escorts. Carting out the wounded, the rapid deployment teams repaired to the parking lot triage area. In their wake, they left behind pools of gooey stage blood and two inflatable fatalities. Post-exercise observations amongst the first responders were openly shared with the event evaluators. One policeman expressed concern about tending to the gravely wounded when they are not medically trained for such an event. But what of the wounded? For two-plus hours the volunteer actors had played their parts to the hilt. Their final instructions were in creative ways to remove the stubborn stage makeup. The syrupy stage blood notwithstanding, Nehme said she impressed with what she saw in the attention to detail offered by the first responders.